Hoka One One's Outdoor Retailer focus was on two new light stability shoes: the 9.3 oz/265 gram Arahi ($130) and the 10.5 oz/ 297 gram Gaviota ($150). As we saw at Outdoor Retailer this year and over the last year in general with the new Altra Provision 3.0, the Brooks Transcend 3&4 , Skechers Forza, and Hoka's own Infinite which controls pronation through a very wide under mid foot platform, and which does not continue into 2017, there is a definite trend towards much less intrusive pronation control. Now often called "guidance" or in Hoka's case "Dynamic Stability" the very firm medial posts and plastic pieces to "control pronation" and which add weight are eliminated in favor of higher rear of mid foot extensions of the midsole into the upper or dual density midsoles closer in density to each other or a combination. The results are shoes that are lighter and of greater appeal than traditional motion control shoes. More neutral runners can also comfortably run them and find more support as legs and form tire. 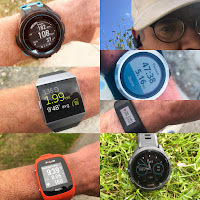 I have had no issues running in any of these new generation stability shoes although I still prefer neutral race shoes with some under the mid foot only stability such as found in the Adios Boost or Salming Distance or the subtle heel area post of the Brooks Asteria (RTR reviews index here). Hoka has chosen a combination of a dual density midsole and some sidewall extensions introducing its J-Frame in the two new shoes. Hoka has had an Active Foot Frame in many shoes with the foot sitting down into the midsole. The J-Frame extends the concept with a firmer density foam on the medial side all the way to the front of the shoe with just firmer sidewalls of the same J-Frame unit up the heel side lateral side. The Gaviota($150) is a premium J-Frame stability shoe. It weighs 10.5 oz/297 grams with the same stack as the Arahi 29 mm heel/24mm toe, 5 mm drop in men's, women's 28 mm/23mm 8.6 oz/245 grams. The J-Frame is made of Hoka's great RMAT material, a high rebound EVA/Rubber blend. Available January. The blue midsole material is the RMAT J-Frame. Even though I love RMAT I might lean towards the lighter Arahi. The popular Bondi Hoka's original road specific shoe gets the last of the Clifton 3 so we expect in the regular width wider than Bondi 4. At 10 oz/ 284 grams the Bondi 5 has a stack is 33 mm heel/ 29mm heel men's, 31 mm/ 27 mm women's. The upper is now engineered mesh which should contribute to a more accommodating fit, especially important in such a high stack shoe with a relatively stiff flex. The Bondi 5 will be available in wide for 3 of the 4 color ways (but not the orange below) for men and in 2 wide color ways for women but not the blue below. The outsole on the lateral front has increased rubber coverage. In Bondi 4 there was a gap in coverage just back of the toe wear area. The Challenger, dubbed by Hoka as the Clifton for trail running, gets the last of the Clifton 3, so more accommodating. Hoka told us runners will find it a touch roomier and more accommodating. The lugs are wider spaced, still 4mm in height, so not extreme, making the Challenger ATR more than suitable for road running as I found with version 1. As with the other shoes in this article the Challenger features 3D Puff Print for additional detailed support. Men's weight 9.5 oz/269 grams, stack height 29 mm/24 mm. Women's 7.9 oz/ 226 grams, stack height: 28 mm/23 mm. Hoka did not give us a preview of the Clayton 2 but the catalog calls out a "refined mid foot fit" with an updated upper and a new sock liner which hopefully will resolve the front of the arch blistering some saw in version 1. 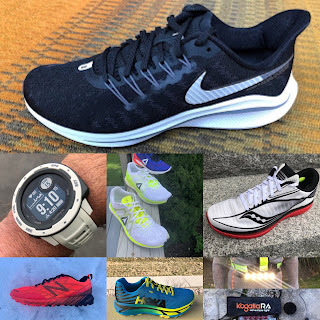 Click Here for RTR's other 2017 Run Shoe Previews: Brooks, Saucony, Salomon, Altra, adidas Outdoor, New Balance and More! Over 40 in depth Road and Trail Shoes reviews so far in 2016! Assuming they have fixed the blistering in the front arch in the Clayton 2, I'd like to see a trail version of that shoe. Thanks for the info from OR! If the D width Bondi 5 is FINALLY going to be roomier, will the Bondi 2EE (WIDE) be wider than the current Bondi 4 2EE. (WIDE)? None of the the Hokas have fit me since Deckers bought and changed the real Hokas in 2013. Does clayton 2 come to have heavy 1oz? Any word if Hoka will provide larger sizes for women???? I wear 11.5 women. I use to be able to wear women's 11 in the Clifton 1 and challenger 1. New ones are too short. . So if they are cut short 11.5-12.
Review New Balance Vazee Rush v2: A Great Value!